"Salty feta cheese and crunchy fried onions garnish the warm, grilled beef topping this salad." Brush steak with 1 tablespoon Chipotle Honey Dressing. Grill or broil steak to desired doneness. Let stand 5 minutes before cutting into thin slices. Divide spinach, cucumber, red onion and red pepper on two large plates. Arrange sliced steak on top of each. Drizzle with Chipotle Honey Mustard Dressing, to taste. Sprinkle with feta cheese and onions, if desired. Whisk together 1/4 cup light mayonnaise, 3 tablespoons water, 2 tablespoons each whole grain mustard, Dijon-style mustard, honey and 1/2 to 1 teaspoon chipotle chile powder. Makes about 3/4 cups. Maybe because it was the first grilling of the season but it tasted great. I've made the dressing again for other salads. Looked twice the canned fried onions? never found them. I marinated my steaks using a balsamic vinigar recipe. Great recipe! Definitely saving this to make for company. 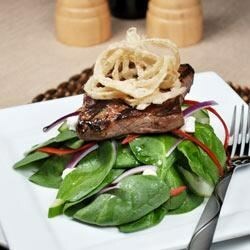 Great different use of leftover steak, different from the usual steak salad with lettuce. Dressing has a nice kick to it. This is a great salad with a nice balance of flavors. It's also a great way to use leftover grilled steak! Thanks for sharing, Dole!